Lutheranism finds itself struggling with something common to all Christian communities. It appears that more and more—even while being situated upon a confessional foundation—Lutheranism is struggling with her identity and how best to express that identity. This can be aptly diagnosed and studied with a focus upon the liturgy (and it attendant rites and ceremonies), for it is in the liturgy that the Church comes together to express her identity in praise and thanksgiving but also to come into God’s presence and receive what the Divine has to offer (to receive an identity). Hence, I choose in this essay to approach this identity crisis through a study of a particular contemporary understanding of the style and substance dialectic (represented not only in Lutheranism), keeping in mind the Reformation heritage and the function of ritual action. Lutheranism’s current dilemma concerning ritual may be no different than any other church body. I would venture to say that the Eastern Orthodox Church is not confronting the same problems as the Lutherans but the Roman Catholics and Anglicans, along with most other denominations are. My contention is not that Lutheranism is not entirely unique when it comes to this issue. The current dilemma over ritual within Lutheranism appears to revolve around the relationship between substance and style. The substance of something in this context deals with the church’s confession. This can be represented by the content of the Ecumenical Creeds, the stories of Holy Scripture, or the belief that the Book of Concord is a true interpretation of God’s Word (and for some binding for that reason). Belief in the truths expressed by all of these statements (and the content of their objects)are things considered substance for the confessional movement known as Lutheranism. Style is conceived of being how the substance is “packaged” and conveyed. In this case, specifically how the liturgy of the Church, through ritual, imparts the substance of Lutheranism to the laity. A leading proponent of divorcing substance from style within Lutheranism is David Luecke (and his approach will be analyzed as an example of this divorce). Although it cannot be said that Luecke represents all or even a majority of Lutherans (numbers not being overly important for this analysis), his approach to style and substance seems to be a growing phenomenon. Luecke is first of all critical of tradition itself. He claims, “The tradition puts distance between [the clergy] and the congregation as audience—by the clothes they wear, the formalities they rely on, the specialized language they use, the distant pulpit they stand behind, the ritual they enact, the unusual songs they choose, and even their readiness to turn their back upon the audience. The tradition takes the congregation for granted.” All of these things—vestments, archaic language, spacial distance, ritual, and hymnody—according to Luecke, distance the clergy from the laity. The main point is: formality takes the congregation’s presence for granted. For Luecke, a way to get rid of this formality is to increase the individuality of worship. By doing so, each person becomes intimately involved and does not feel in any way left out. Instead, they are encouraged to share their personal feelings, and what could be better than that for enriching the liturgy? “To concentrate on enriching the fellowship life through shared personal prayer is a style improvement that seems the most practical step toward more infectious faith talk.” It must be noted that Luecke considers moving the structure of worship from community centered to individually centered as a matter of style and not substance. While the outward presentation has changed, the truths that lie behind these externals have not. The divorcing of style from substance is pivotal for Luecke. He contends over and over again that certain changes to style will in no way change its substance. “So long as personal experiences are shared in a context that appreciates and shares doctrinal truths, there should be no change in Lutheran substance.” The question begs: What, if anything, would change the substance? For Luecke, the substance is changed when things like Romanizing sacramentalism works its way into the Lutheran style of presenting the substance. To take the Lord’s Supper for example, the understanding that Christ is corporeally present is unchangeable substance. The frequency of celebration is changeable style. “If stalwart Lutheran leaders from previous centuries were to look at this situation of Lutheranism in America today, one word would come quickly to their minds—a word now seldom heard: sacramentalism.” Another example, according to Luecke, is the shortening of sermons down to fifteen minutes or less in order to increase the celebration of the Lord’s Supper to weekly means that style has changed the substance. At this point we may be led to wonder: Why does changing the structure of the liturgy from community centered to individually centered not do the same thing (i.e. change the substance)? We must begin to ask if this a valid distinction (separating substance from style) based up Reformation principles. Can Lutheranism distinguish between the substance and the style that imparts that substance? To follow upon this dilemma we will first look at how ritual actions function. This will be fundamental in establishing what rituals are meant to do and what they actually accomplish. Following upon that we turn to the medieval church’s use of rituals and consequently the Reformation’s impact upon that use. 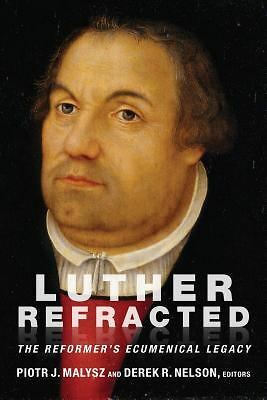 Finally, we will return to our questions and to the situation presented to us by Luecke in an attempt to reconcile the Reformation with a modern Lutheran approach to ritual. 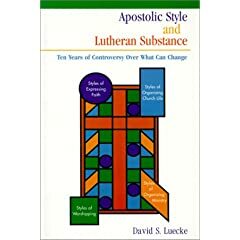 David S. Luecke, Apostolic Style and Lutheran Substance: Ten Years of Controversy Over What Can Change, (Lima, OH: Fairway Press, 1999), 9. This current approach to outreach is abhorrent to those of us who grew up in the traditional CongregationaL, Voters Assembly environment. Currently the “Mission and Ministry Agenda, is akin to the Catholic Hierarchy. And believe me, it is not working.